Some people seem to be able to go through their whole life without having to use their oven. They also manage to get through their lives without ever having to worry about oven repair. However, if you like preparing healthy meals for your family, enjoy the act of preparing food from scratch, or love to bake; it’s likely you use your oven … a lot. When it stops working, it’s easy to think your entire world has come to an end. Without a working oven, how are you going to prepare the meals your family loves so much? The best way to make sure you never find yourself panicking over what to do about a broken down oven will be making sure the oven gets the care it needs. There’s more to maintaining an oven than simply running the self-cleaning option a couple times a year. In addition to keeping it clean and making sure you never stuff more food in it than it’s designed to cook, you also need to contact L.A. FixIt and set up yearly maintenance appointments. Our oven repair technicians have the experience and knowledge needed to thoroughly go over your oven and look for signs that it’s getting older. If they see worn parts, they’ll replace them than, rather than waiting until the part breaks. The regular maintenance calls extend the life of your oven while also practically eliminating emergency oven repair disasters. Homeowners aren’t the only ones who need to learn how to properly care for the ovens. We’ve been somewhat alarmed by the number of L.A. restaurants who’ve never had their oven looked at. As part of the food service industry, you really can’t afford to have your oven suddenly stop working. By making sure it gets checked out by a trained professional you reduce the chances of you someday losing thousands of dollars in revenue because you were unable to prepare your signature dishes. Regular maintenance work also keep the amount of energy your stove uses to a minimum. The older you oven gets, the more frequently it will need to have maintenance work done. Even when you’re careful and take care of your oven, things can go wrong and you could turn on your oven and find it doesn’t work. When this happens we urge you to contact L.A. Fixit right away. What you don’t want to do is continue using the now faulty appliance. Continued use could cause the problem to become even worse and you could find yourself ruining your oven altogether. Even more alarming is the possibility of the malfunctioning oven doing you serious harm. Here at L.A. FixIt we feel your first call should be to the gas company to have them shut off your gas. By turning the natural gas off, you won’t have to worry about gas leaking and possibly triggering a fatal explosion. We think you’re second call should be to us. When you need your home or commercial oven repaired, you shouldn’t worry about the time. We set things up so you can call L.A. Fixit 24/7 and reach a knowledgeable person who will listen to the problems you’ve experienced with your oven. If you’re lucky, the problem will be very small and the L.A. Fixit representative will be able to walk you through the process so you can fix it yourself. If the oven repair you need is bigger than you can handle, the representative will put together an estimate for you, and start to make arrangements to send one of the professionals we hire to your home or place of business to check out the situation. It’s come to our attention that some Los Angeles residents and business owners would rather replace their malfunctioning oven than have it repaired. They’re so worried about the cost of the repairs, they feel the expense of a new appliance will be cheaper. We urge to reconsider. We have put a great deal of work into keeping our prices fair and reasonable. We feel that once you give us a call and collect our estimate, you’ll reconsider dumping your current oven for a brand new one. We promise to honor the estimate we provide. As long as you leave your oven repair needs in the capable hands of L.A. Fixit, you won’t have to worry about things like hidden fees and gimmicks. We won’t even charge you for the time it takes to get from the office to your place and back again. We strongly believe in up front and honest business practices. 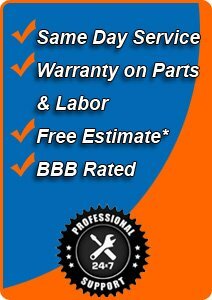 Just because we offer a great price for oven repair, it doesn’t mean the work we do is sub-par. Far from it. We scoured the Los Angeles area and hired only the absolute best oven repair technicians we could find. The oven repair professionals we hire have more than just a great deal of experience, they also have taken the steps needed to get themselves factory certified. When they show up at your home or place of business, you can rest assured that they will handle the situation in a professional manner. That they’ll quickly diagnoses and repair your oven, while also looking for signs of future trouble. If they see something wrong, they’ll alert you to the situation and let you decide if you want to have the issue dealt with right away, or if you prefer to wait until the oven breaks down again. The sooner you take care of our 24/7 service hotline and book an oven repair appointment, the sooner you can get back to making your favorite baked treats and home cooked meals.